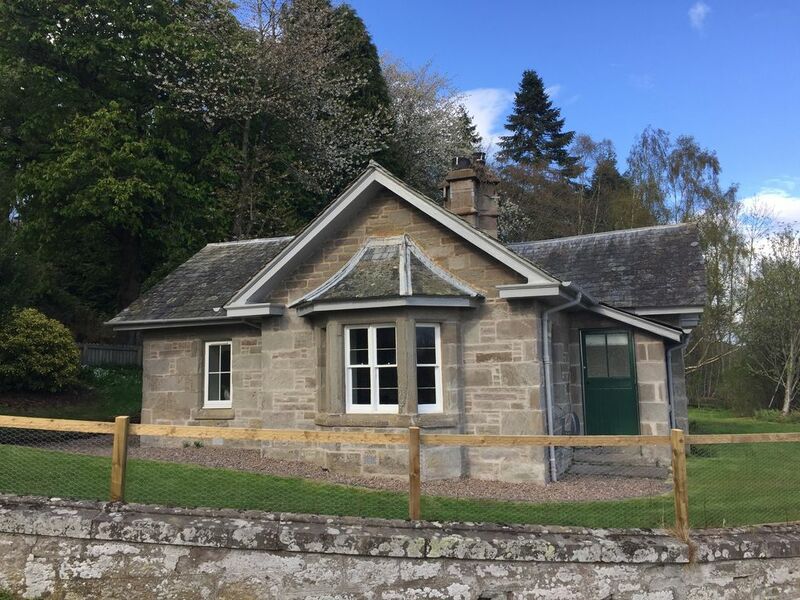 South Lodge is a traditional detached lodge house situated at the entrance to Dupplin Estate . It offers rural access to the countryside while only 5 minutes from Perth. Recently refurbished the property offers a double bedroom with a 4-poster king size bed and en-suite shower room. There is a twin bedroom and family bathroom (with a bath and overhead shower). The living room has a wooden burning stove and there is a separate dining room with seating for 6. The kitchen is fully equipped. Rural internet - not high speed. We are only able to provide internet via mobile broadband and as a result data usage is limited to an average of around 1Gb per day. The lodge is situated on Dupplin Estate in a site of landscape importance with and abundance of wildlife and specimen trees. Enjoy relaxing walks in the countryside on our working farm or use us as an ideal base to explore central Scotland. Visit the new Forteviot Cross on the Estate commemorating King Kenneth MacAlpin (King of the Scots and considered by many the founding father of Scotland who died in Forteviot in 859). Gleneagles golf course is only 15 minutes away. This is the ideal base for excellent day trips to Edinburgh , Stirling, Glasgow and the Highlands to give you a taste of everything Scotland has to offer. Dupplin Estate is home to the Dewar family. We are actively involved in farming on the estate , forestry and managing our long term let cottages. We decided two years ago to create our first holiday cottage and South Lodge is our second project. Following our recent success with turning a derelict cottage (Earn River Cottage) into an ideal rural escape we decided to convert this lodge house at the southern entrance of the Estate into a holiday let too. The two cottages are a stones throw from each other so an ideal let for two families wanting to go away together but with their own space. Lovely views of the Earn valley. Walking access to the woodland and policy parks in the heart of Dupplin Estate (a family run estate). Trout fishing is available on the Earn river and wildlife abound the estate. Following a successful red squirrel conversation project reds can be seen scurrying all over the place in summer. Outdoor hot tub and enclosed garden. 5 minutes from Perth and an excellent base to explore Scotland, the highlands and numerous gold courses. Rural internet - not high speed We are only able to provide internet via mobile broadband and as a result data usage is limited to an average of around 1Gb per day. Thanks so much for leaving your review. We're glad that you liked the cottage. Perhaps we will see you on the Estate again sometime in the future. Me my wife my best friend and his partner had a fantastic 3 night say in this beautiful cottage for my 40th birthday ! It was nice and modern on the inside with great facilities a favourite of mine being the log burner and the hot tub which was totally relaxing to sit in on a chilly night and look up at the stars ! The cottage was immaculately clean with everything that you needed. We were a bit disappointed that the internet allowance ran out after about 4 days but apparently that allowance is explained on the website. The estate office were very helpful and friendly and resolved the problem this caused us with no fuss. We thoroughly enjoyed our stay and we would recommend this lovely cottage to anyone. Thank you so much for taking the time to add a review of your recent stay at South Lodge. We are glad to hear that you enjoyed your stay with us, despite the internet issue. We completely understand your comments on the internet; it is very frustrating for us also. Being rural, we are unable to get BT Broadband and unfortunately are limited to 4G. To try and avoid the disappointment of guests, we do state on the HomeAway website prior to booking that we are only able to provide internet via mobile broadband and that it averages out at 1Gb per day. As a result of your comments, however, I have tried to make this information clearer on the HomeAway website in order to avoid any further disappointments. We are hopeful that at some point in the future BT will look at all the rural areas which are currently unable to get Broadband. Thank you again for your comments, they are appreciated. lovely cottage to stay in..
angie one of the staff met us at the cottage to show us round... . im a fussy person as I like places to be clean ..as soon as we walked in I loved it . it was like a show house , it was very very clean . it had everything you could want. a welcome basket with jam biscuits coffee milk in fridge to start us off.. the grounds were lovely . peaceful,no one to bother you..donrayn who is the owner... leslie and angie. who are .staff ,are only a few minutes away if needed and all are very nice and helpful if you love the country you must give the cottage a try. .you are only about 9miles into perth ,,, shopping centre and food shop just before perth... we thank all the staff very much for a lovely holiday at the cottage thanking you ,,,peter patricia.. Many thanks for taking the time to write that lovely review. We are delighted that you were happy with everything and it was an absolute pleasure to meet you both. Hopefully we will see you on the Estate again in the future. Neat place that was well appointed. We loved the location as a central starting point for our journeys through Perthshire. The hot tub was great for relaxing after a day of driving. We can highly recommend the property and will. A welcome in person, every detail was thought out, couldn't ask for anything more. It made our holiday so much more, than we could imagine! Thank you very much for this experience.